Lapis is a deep blue stone often with gold flecking that twinkles like stars. The most desirable lapis is solid, deep blue with no white calcite spots and just a sprinkling of glittering golden yellow pyrite. Such material is found only in Afghanistan (mined there for over 7000 years) and Pakistan and……….there is a limited amount of lapis mined in the western part of Colorado (Italian Mountain) that is deep blue with large amounts of pyrite. Other places where lapis is mined include Egypt, Mongolia, Canada, and Chile. The name lapis lazuli is a combination of the Latin word lapis (“stone”) and the Arabian name azul, meaning “blue.” Lapis is one of the few rocks considered to be a gem and is one of the first gemstones ever to be worn as jewelry. A lapis gemstone won’t fade in light and does not show wear normally but like many gemstones, it can be scratched and chipped. Clean it only with a soft, dry cloth to maintain its shine. The astrological sign of lapis lazuli is Sagittarius. Lapis can also be a deep blue black, mysterious color such as this ring. Denim lapis is a light bluish-white form of lapis lazuli. This stone comes close to the color of faded denim material, hence the name. This pendant looks like stone washed denim, doesn’t it? Sodalite is a rich royal blue mineral that together with hauyne, nosean and lazurite is a common constituent of lapis lazuli. A light, relatively hard yet fragile (due to the inherent cracks) mineral, sodalite is named after its sodium content. 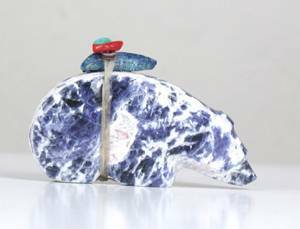 Well known for its blue color, sodalite may also be grey, yellow, green, or pink and is often mottled with white veins or patches. The more uniformly blue material is used in jewelry, where it is fashioned into cabochons and beads. That with more veining, patches and mottling is used in carving for interest. Although very similar to lazurite and lapis lazuli, sodalite is royal blue rather than ultramarine. Sodalite also rarely contains pyrite, a common inclusion in lapis. Sodalite’s poor cleavage may be seen as incipient cracks running through the stone. Like many stones, there are imitation stones made and they are called block. Sometimes block stones are made from crushed real stones. Other times they are made from any kind of stone, then dyed. Here is an example of a block lapis ring. It is a pretty ring made with sterling silver and has the artist’s hallmark. Yet it is what it is – block denim lapis. Besides being set as cabochons, lapis is also used to make beads which are used in Santo Domingo and Navajo necklaces. Lapis Chip “rope style” necklace by the Teller family, Navajo. Lapis is a beautiful stone and if you’re like me and love blue, it is a stone for you.